– Kate S., a patient of Dr. Calcaterra. 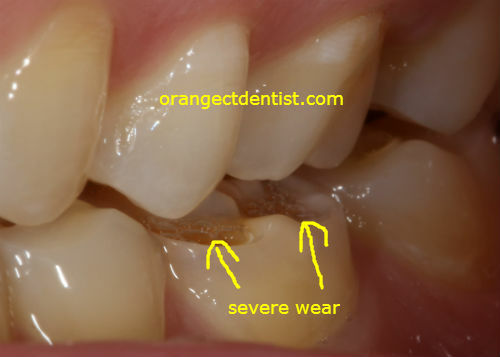 Wear on lower teeth caused by clenching at night. Photo and appliance treatment by Dr. Nicholas Calcaterra. In our dental practice in Orange, CT, we make numerous types of oral appliances (commonly known as night guards or nightguards) for a number of different conditions. These conditions include grinding (also called bruxing or bruxism), clenching, and many conditions which affect the TMD – temporomandibular joint. The appliances are worn at night and function by reducing or eliminating the forces on the teeth, facial muscles, and TMJ generated by the above activity/activities. By regulating those forces, many symptoms which fall under the classification of TMD (temporomandibular joint dysfunction) can be addressed in a non-invasive, non surgical manner. We’ve seen many patients over the years completely resolve their symptoms once the appropriate appliance was made for them. You’ve lived with frequent headaches for much of your life. You hear clicking, popping, and or crackling sounds from one of your jaw joints and there is some pain with those sounds. You get sinus-like headaches even though there is no congestion or any evidence of any sinus infection. You know you grind or clench your teeth. You have tried numerous medications to relieve your migraines with limited to no success. Your headaches appear to get worse at times in your life when you are more stressed. In the mornings do you feel like the woman in the picture below? Woman with A.M. headaches due to clenching. Do you feel like this? If some or all of the above points apply to you, it is likely you are suffering from TMD. TMD includes a wide spectrum of disorders which can present with different types and area of pain. What is common about them is these afflictions typically do not respond well to medications or other traditional approaches. In our dental office in Orange, CT, we often prescribe the NTI-tss device, which is an FDA-approved, non-medication treatment for Tension Headaches and Chronic Migraines. In the studies with the FDA, the researchers concluded that 82% of patients reported a 77% decrease in headache symptoms. 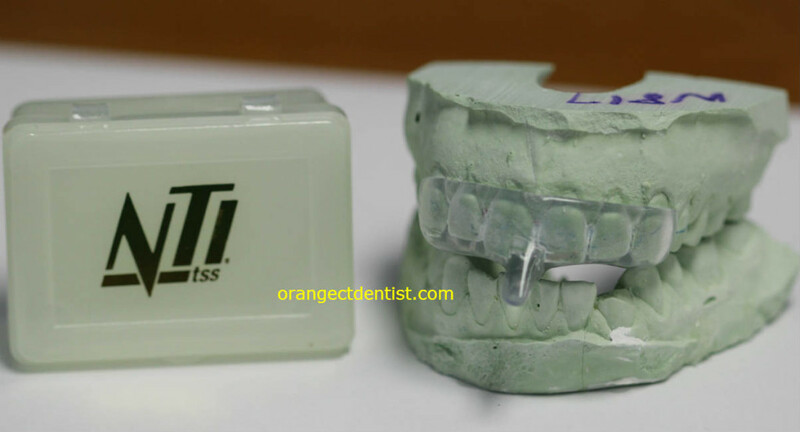 NIT Appliance on tooth models along with the carrying case. The theory and mechanics behind the NTI are easy to understand. Simply put, it is a small mouthpiece that prevents your from grinding or clenching your teeth at night. It is the constant grinding or clenching (also called bruxism) for several hours each night that causes muscle and joint fatigue which translate into pain. How does this mouthpiece do that? Well first visualize yourself taking a pencil and trying to crush it with your back teeth. You can! But then visualize trying to do that with your front teeth only. You can’t! A feedback loop in your nervous system prevents your muscles from contracting hard because it “knows” your front teeth can’t handle those forces. So let’s design a nightguard that only goes on your front teeth. That is the design of the NTI. The full name of the device is the NTI-tss which stands for Nociceptive Trigeminal Inhibitor – tension suppression system. You can read about the details here. Note that these appliances are not indicated for patients who either snore or have obstructive sleep apnea. 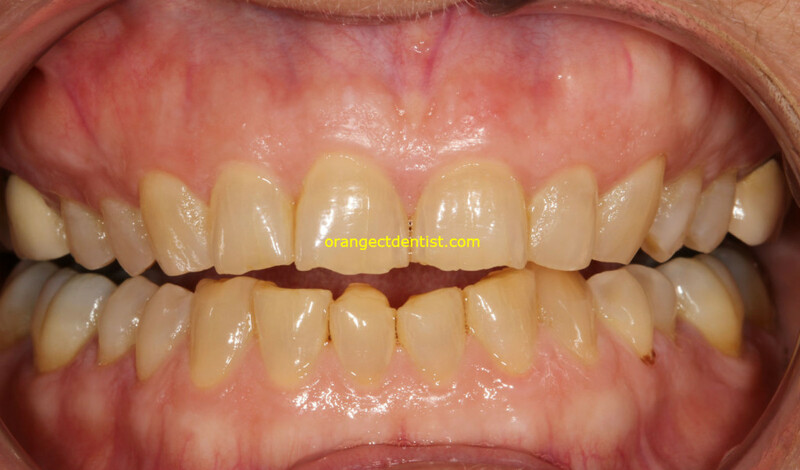 This patient was treated by Dr. Nicholas Calcaterra with a full arch nightguard to prevent her from wearing her teeth down even more. Photo by Dr. Nicholas Calcaterra. Drs. Nicholas and Carla Calcaterra have helped literally hundreds of headache-prone patients in the Orange, Woodbridge, and West Haven areas eliminate these types of headaches with the NTI appliance and other nightguards. Call us at (203) 799 – 2929 to make an appointment or click here.